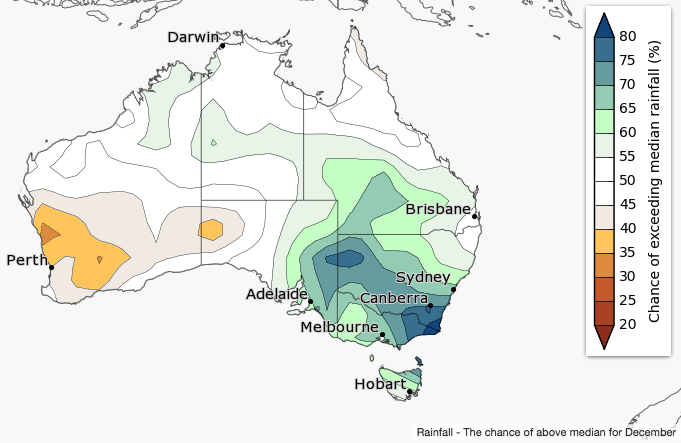 The summer rainfall outlook issued by the Bureau of Meteorology this morning shows no strong swing towards a wetter or drier conditions for most of Australia. 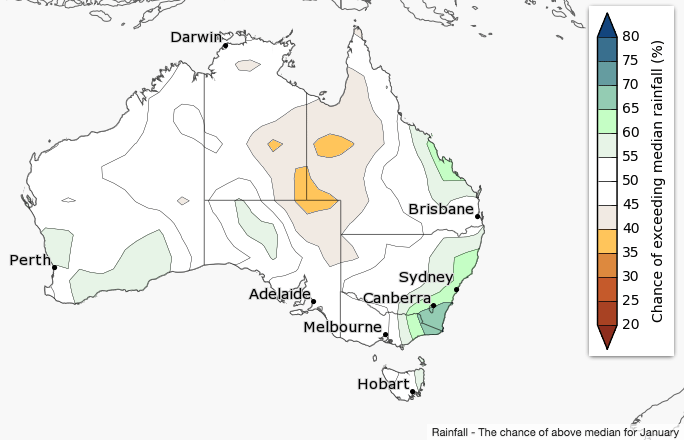 Parts of the Pilbara and Gascoyne in WA, and coastal regions of southeast Australia, are likely to have a wetter than average summer, while the northern Cape York Peninsula may be drier than average. 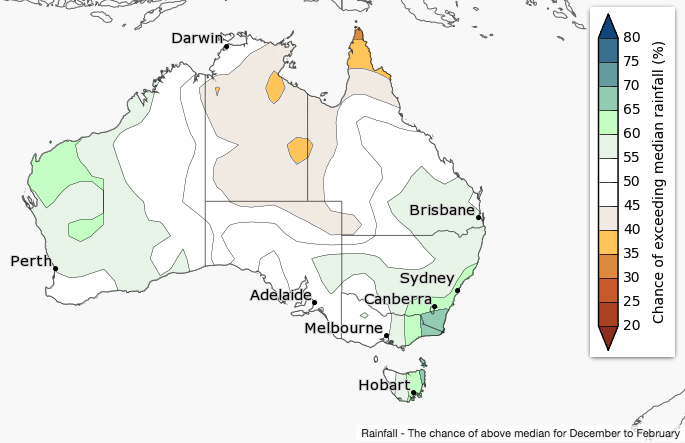 December is likely to be wetter than average for southeast Australia, extending up into southwest Queensland. 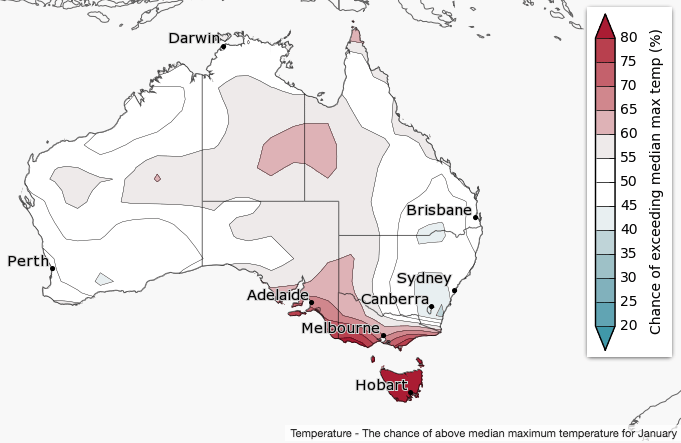 Summer daytime temperatures are likely to be warmer than average for southeast, central and far northern Australia. Summer nights are likely to be warmer than average for northern, central and southeastern Australia and along the southern WA coastline. The tropical Pacific Ocean is approaching La Niña thresholds, and our ENSO Outlook is at La Niña ALERT. This likely 2017-18 La Niña event is forecast to be short-lived and weak, with sea surface temperature patterns in the western Pacific and eastern Indian Ocean not typical of La Niña. As a result, there’s little push towards widespread wetter conditions across much of the country. See the Climate Influencessection for more information. 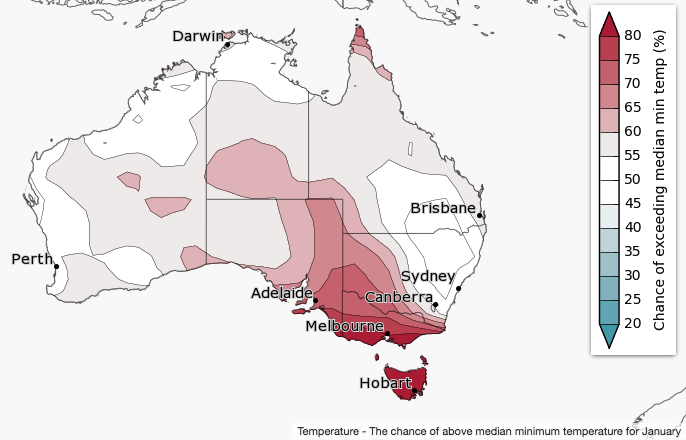 Summer daytime temperatures are likely to be warmer than average for most of SA, Victoria, Tasmania, the southern NT, and far northern Australia. Summer nights are likely to be warmer than average for northern, central and southeastern Australia, and along the southern WA coastline. Historical accuracy for maximum temperatures is moderate over WA, the Top End of the NT, and the eastern mainland. Elsewhere, accuracy is low. Minimum temperature accuracy is moderate for most of Australia except the central NT and parts of the Gulf of Carpentaria. 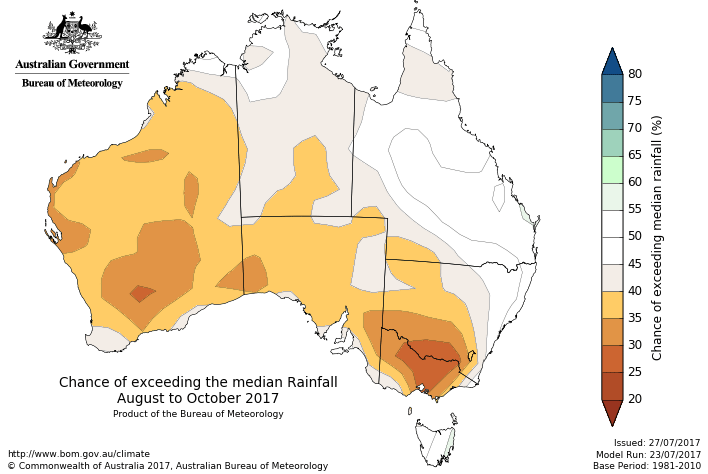 Maps below compare BOM’s rainfall forecast for August to October 2017, released in mid-2017, with actual rain that fell over the August to October 2017 period.